DAM weather! 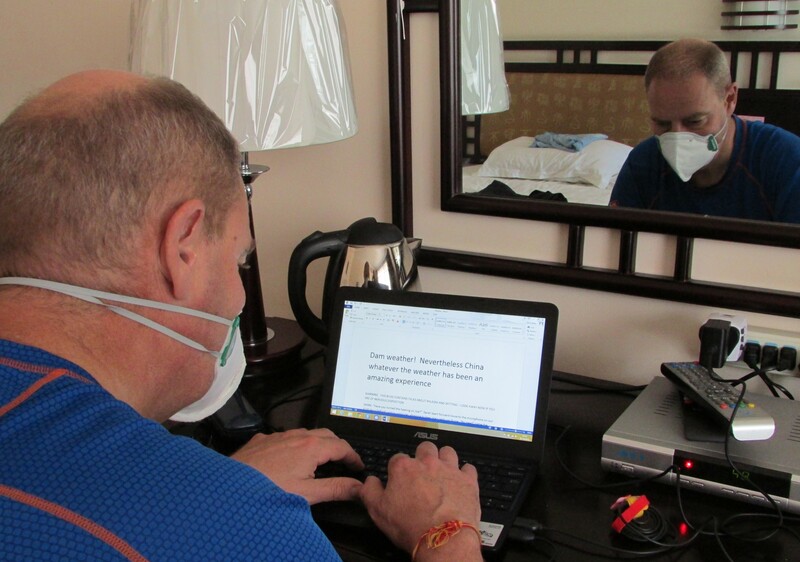 But grey skies can’t TAKEAWAY brilliant China experience | "MASTERS"
WARNING: THIS BLOG TALKS ABOUT PHLEGM AND SPITTING – LOOK AWAY NOW IF YOU ARE OF A NERVOUS DISPOSITION. 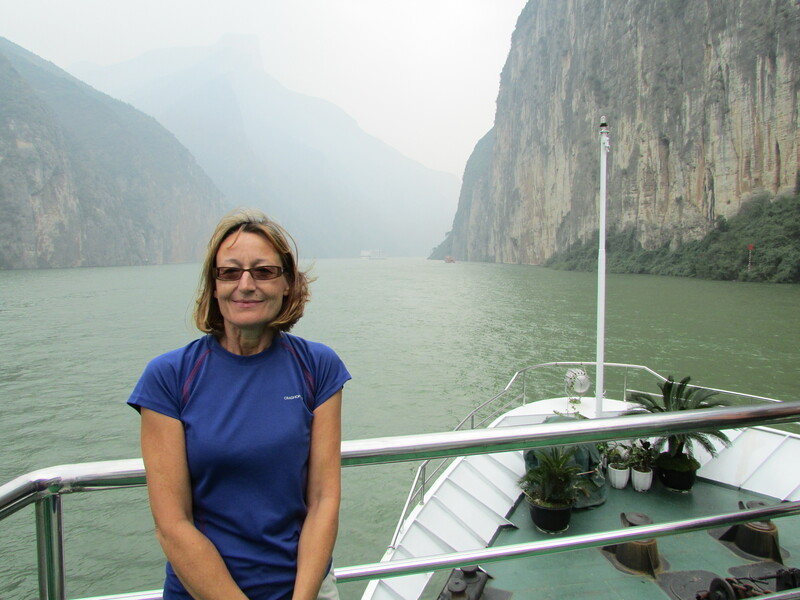 Not the same here in China at the moment – and we were doing so so well! For the first two weeks in the Peoples’ Republic, we’d had day after day of bright blue skies and temperatures in the mid to late 20Cs. The late Autumn rays a real tonic. 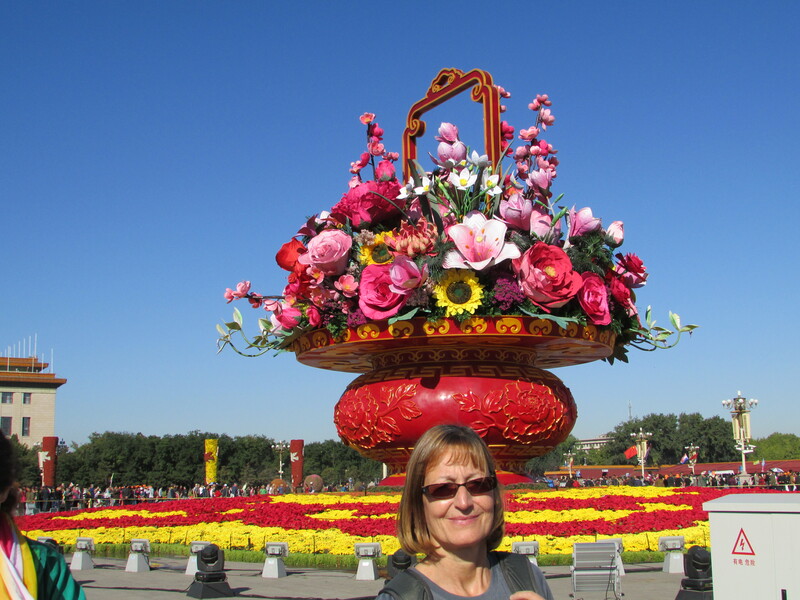 Sarah balancing a bouquet of flowers on her head in T Square Beijing when the sky was still blue.. But then we moved south from Shanghai and started to encounter the grey skies which many parts of this country “enjoy” for 250 + days a year. The temperature has still been around 20-23C but the smoggy/foggy atmosphere has been awful and seriously depressing. At one stage whilst riding a tandem with Sarah on the city walls of Xian I had to ask what the yellow thing in the sky was. The pollution in the air has been horrific. I’d always laughed in the past at photos I’d seen on the Internet of Chinese people wandering around wearing silly white masks. Now I walk around with a silly white protective mask that I bought @ B&Q Farnborough, back in August. But my God I have needed it. I’ve suffered from a head/chest cold for the last four weeks. “Suffered” is my word, Sarah just tells me to “man up and get on with it”. But my man flu cold has been made that much worse by the pollution in the atmosphere. Every morning I “do a Chinese”. Thick green phlegm stuff builds up overnight and has to be discharged. Not nice. But I can now understand why many Chinese men and women do spit – but struggle with where they do it. The road/pavement is bad enough but the local sport in the south of the country seems to be to spit from some distance in to waste bins strategically placed in supermarkets and restaurants and often close to food and people eating. 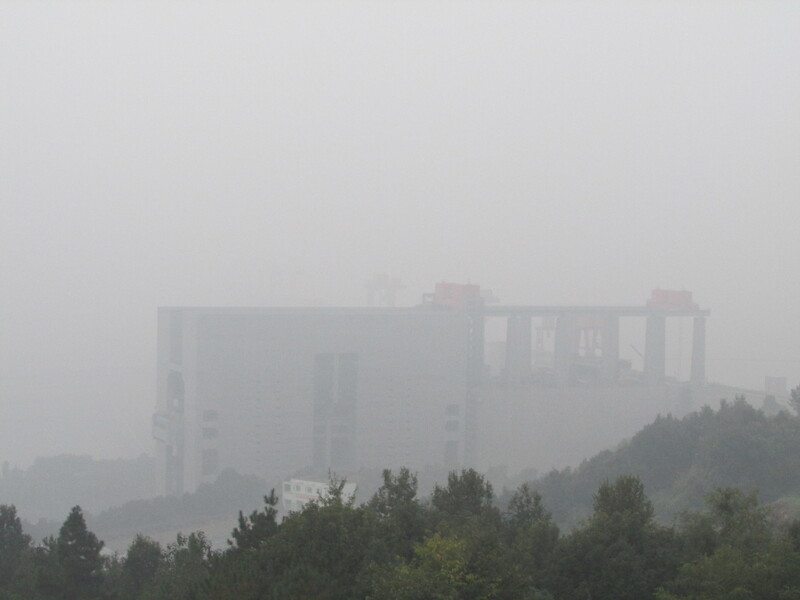 The weather conditions are in part linked to the Chinese economic juggernaut. 70% of their energy is generated by burning poor quality coal at hundreds of local and regional power stations. The emissions mix with the fog which is prevalent in many areas and due to the topography of the country, tends to sit over towns and cities for days as there is often limited wind to blow the polluted air away. Chengdu a classic case in point with car headlights shining brightly on the murky streets at 3.00pm in the afternoon. But it isn’t just belching power stations and micro-climates that causes this “pea souper”, reminiscent of ICI Wilton/Billingham on Teesside in the early 1970s. 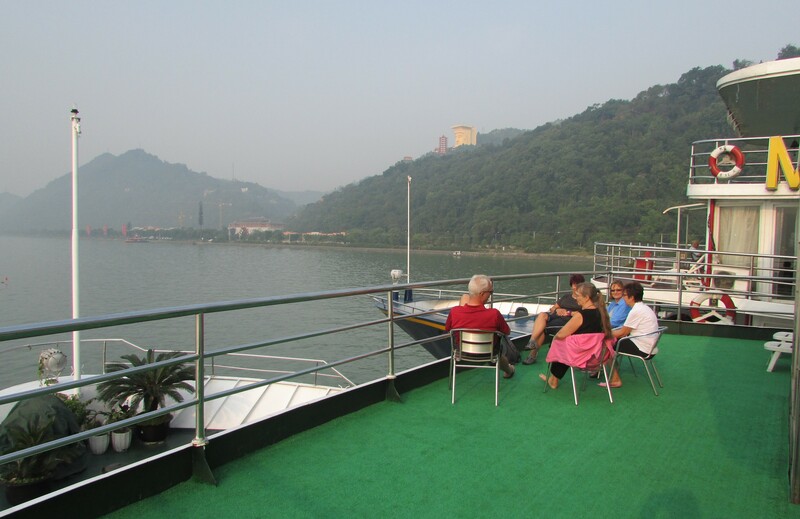 We’ve just had the amazing experience of travelling in the Presidential Suite, gliding down the Yangtze River through the THREE GORGES on board the MS Victoria V.
The Chinese have built a massive 2km wide dam near Yishang. This has raised the water level by over 100m, displacing tens of thousands of unfortunate locals who had no choice but to move out. Local people I talked to, confirmed that the flooding and water level increase has changed weather patterns. Grey skies are common and it also rains more. Mess with nature and this is what you get methinks. 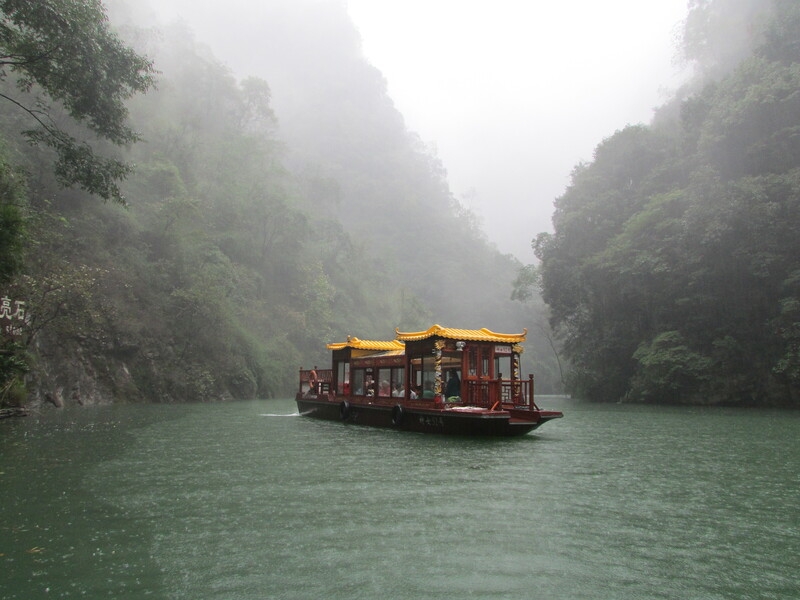 However despite the rain, it was a truly awe inspiring journey, down the World’s third largest river. The £80 upgrade for four days allowed us to bask in luxury in a room four times the size of our fellow group members’ cabins! I’d ask reception speculatively if it might be possible, having seen graphics on the internet of the Presidential Suite (PS) and the private deck at the front of the boat. When the lady smiled and said yes and was only charging £80 quid, I bit her hand off. I felt sure she had missed a zero off the end of the price and paid on the spot before she had the chance to change her mind. 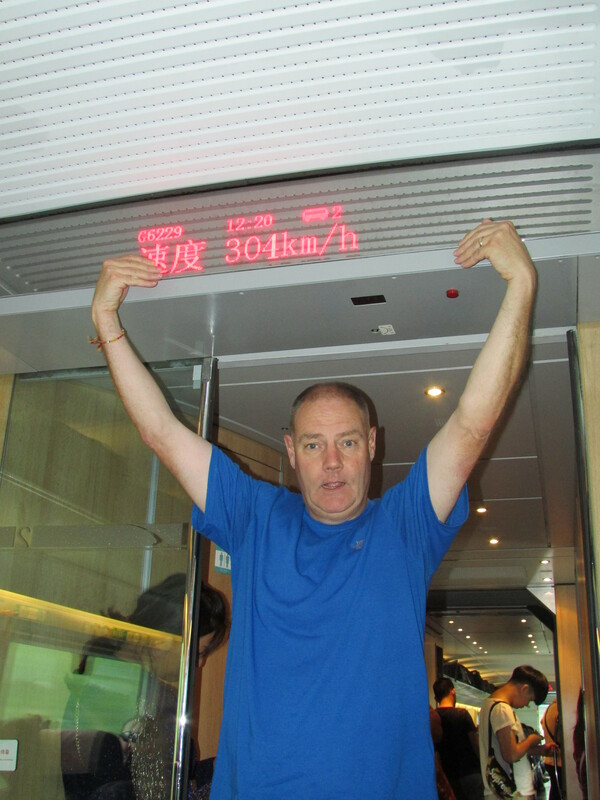 The Suite came in to its own at 11.00pm on the final night, as we arrived at the Three Gorges Dam, 600km from our starting point at Chongqing. 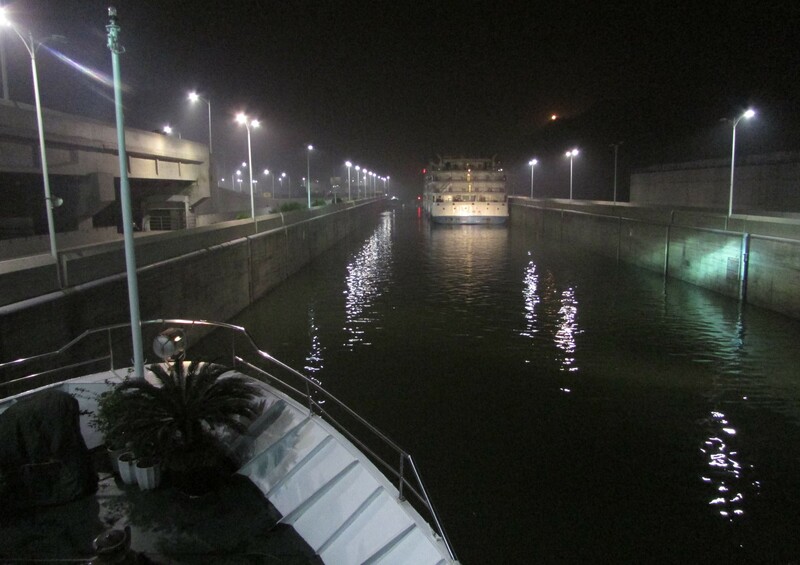 We graciously (joke) allowed our Group Travellers to stand with us on our 15 metre wide private balcony as we entered the largest flight of man-made locks in the World – five of them. It made Bingley ‘Five Rise’ look like something out of Lilliput in comparison. This is, make no mistake an amazing man made structure. And putting aside for one moment the fact that hundreds of thousands lost their homes, the eco-system has taken a massive hit and the local weather is now “all confused” you have to admire what the Chinese have done here. 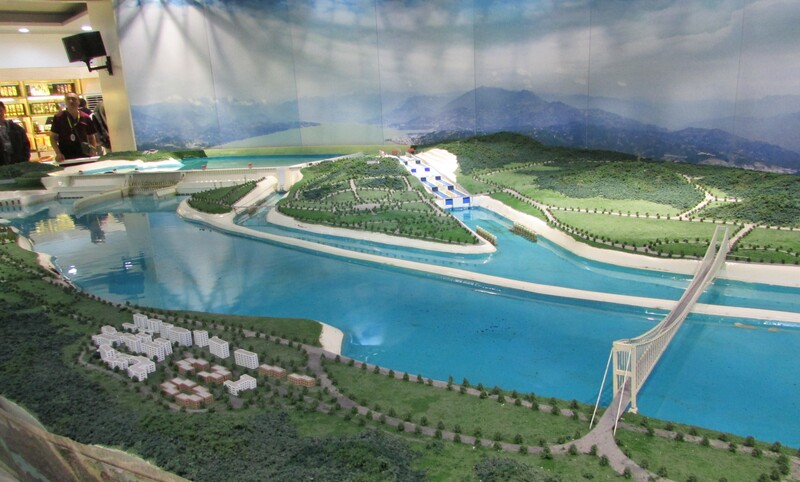 Our local Guide claimed it was all to do with flood management, navigational aid and the provision of green power. But the dam provides just 2% of China’s power requirement. And when the weight of water causes an earthquake, I wouldn’t want to be one of the many millions down-stream, as it will make the “Dam Busters” look like a little rain shower in comparison. This was the best shot of the dam we had – a model! 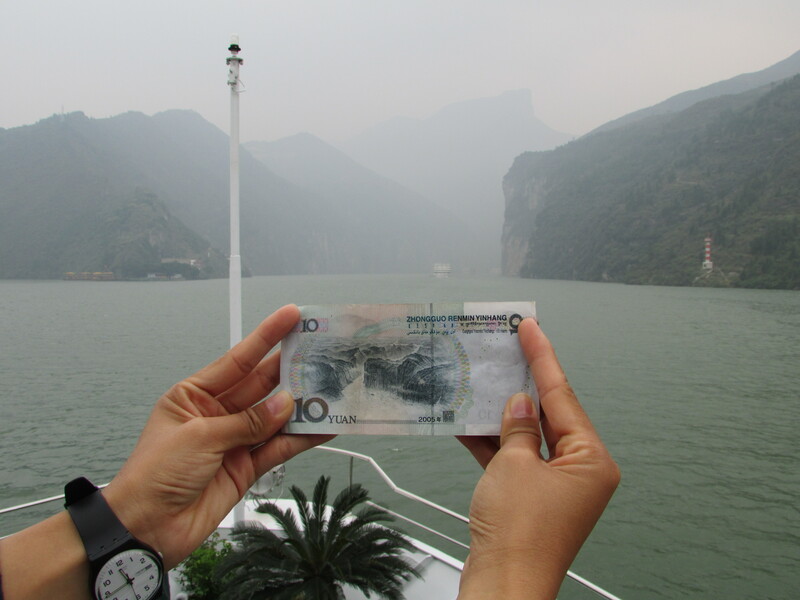 Just one more day in China, before we arrive in Hong Kong. 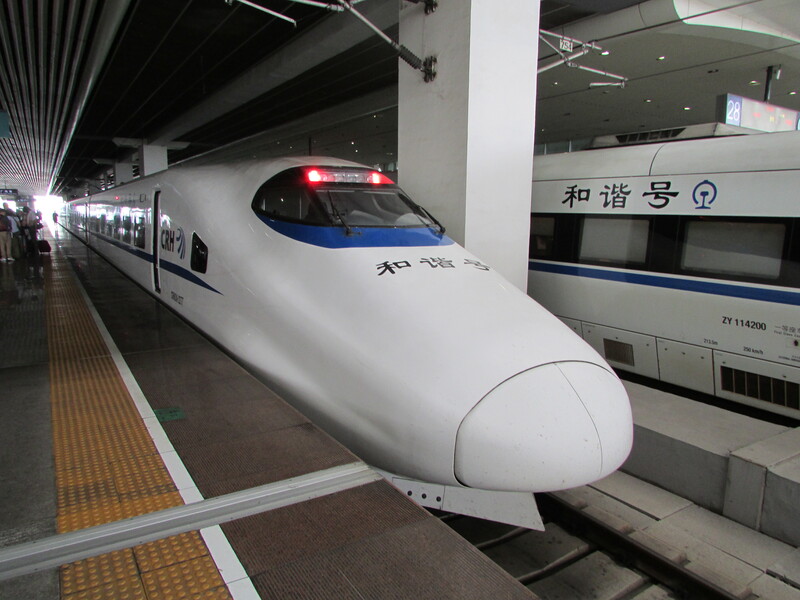 And one more treat in store for me as we travel for three hours on TWO new “Bullet Trains” the first of which runs at 260kmph (163mph) and the second a slightly quicker 320kmph (200mph). James Duckworth/Alastair Black/Richard Daw/Steve Elliott/Neil Barton/Phil Whitby – what about this as a potential RAT experience? Even Sarah – who is now suffering from a cold AND a prolapsed/slipped disk is looking forward to this trip and the chance hopefully to see some blue sky. Brilliant experience – we must build more railways – our B Train! I must clearly state get well soon the both of you. Keep up the amazing adventures, blog and pictures. Question – has every meal the past two weeks been a takeaway? Enjoy. thanks for your note – we are now both very well and enjoying Laos. YES -every meal a take away. Hope all well at the OS. Great to see all the pics, amazing as ever, but sorry about bugs and backs. I guess all the different beds may have jinked Sarah’s back and as for the cold err man flu + smog, not good. Very dull and wet at home, but certainly not cold!